This timely publication addresses much of the misinformation about the trans community that persists despite increasing media coverage both popular and serious. Both authors are well placed to speak to the complexity of issues facing trans individuals. 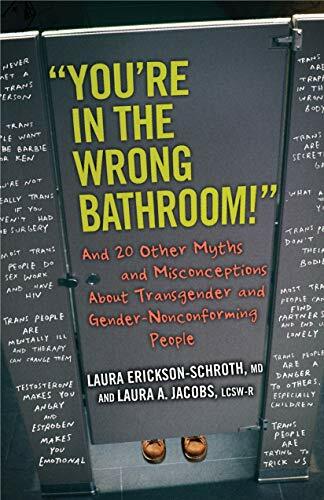 Laura Erickson-Schroth MD,MA is a psychiatrist working with LGBTQ people in New York City is the editor of Trans Bodies, Trans Selves, a resource guide written by and for transgender people. Her co-author Laura A. Jacobs LCSW-R is a trans and genderqueer-identified psychotherapist, writer, activist and public speaker working with transgender and gender-nonconforming, LGBTQ and sexual/gender diversity issues. The 21 short chapters each headed by a “Myth” address a variety of issues about transgender and gender-nonconforming people within the broader debate as to how we can or should untangle the influences of nature and nurture on sexuality and gender. The authors scrupulously present the range of different positions on each issue addressed, so anyone hoping for easy cut-and-dried answers will be forced to think again. Myth 13, from which the book takes its title, focuses on anti-trans legislation on bathroom access in schools and public places advocating for gender neutral restrooms (which used to be called unisex) and for more bathrooms for all on grounds of health and safety. The difficulties in accessing hormones and surgery, the lack of legal protection in the education system, in employment and in housing are all discussed, demonstrating in different ways and at different levels (federal and state) how the law still lags behind social progress. The later chapters examine the reasons behind anti-trans feelings and actions in some feminist groups, and the ongoing efforts of LGBTQ+ community to demonstrate that there is more strength in solidarity than in dispute. The book, which will enlighten both general and specialist readers, includes a full range of documentary references, conferences, organizations, and sources of funding for the cause.